Mastermind Toys also sells the original Tangle Jr. for $3.99 but for the extra $1, I’d go with the textured one every day. I have 4 different Tangles and 2 of them are textured and those are the most popular with the kids I work with by far. The smooth Tangle Jr. is great for grownups but for kids, I love the sensory stimulation that the Tangle Jr. Textured provides. I usually pop them apart and add a key ring with a zipper pull attached to them so they can be hooked onto backpacks or belt loops. Tangles are quiet and are great at occupying fidgety hands for hours without being distracting to others. They come in a variety of colours, are portable, and the textured ones give you the choice of having sensory input or not as they have some smooth sections as well. To play with the Tangle Jr. Textured you simply loop and wind it around and around, twisting it into fun shapes. You can make a bigger Tangle Jr. by snapping two together though I find the size one of the most appealing features. Tangle Jr Textured has both textured and smooth sections. Twiddles are a cousin to Tangles in my world. They’re a bit bigger, and are meant to be taken apart and reshaped into various shapes and configurations. They’re best for slightly older kids and ones who won’t put the pieces in their mouths. I love the variety of colours twiddles come in, I own a blue one myself but also love the silver and glow in the dark options. Twiddles are great for keeping hands occupied and also for creating fun shapes and sculptures with them. Twiddles are also great for kids (and adults) who need a bit of work on fine motor skills or who find taking things apart and putting them back together relaxing. 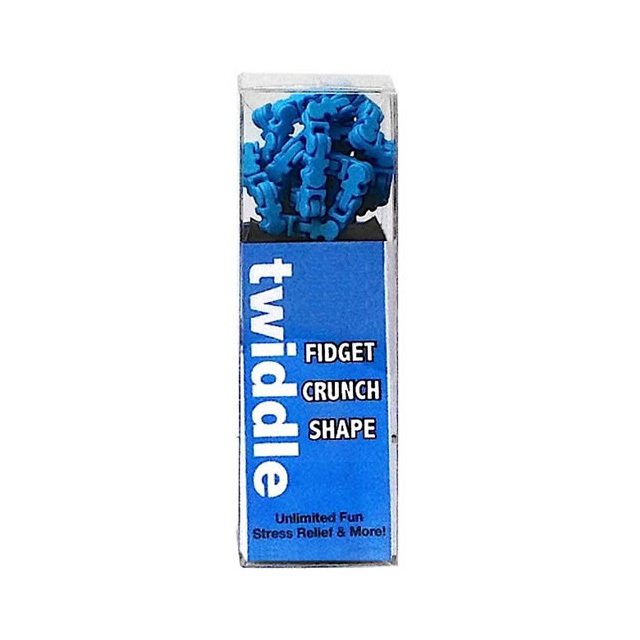 The fact that they’re designed to come apart makes twiddles great for kids with anger management issues as they’re pretty much impossible to actually break – they just break apart if you give them a sharp tug. Yes, the Original Fidget Cube is more expensive than the knockoffs, but I’ve owned a few of the knockoffs and I love the Original Fidget Cube the best. I will post a link to the only knock off I’ve used and not disliked but the movement is not as smooth when using it and doesn’t feel the same in hand as the original. The other knock offs I’ve had have been dismantled in a matter of minutes so either go with this one from Amazon or get the original one. I love the variety of colours available in the Original Fidget Cube and the variety of ways to use it. I most often use the Breathe side which is a smooth indentation that fits my thumb perfectly. The other sides allow users to spin the dial (makes a fairly quiet whirring noise), press one of the five buttons (2 of them are completely silent), flip the switch (this is the loudest side but if you press in while flipping it’s silent), glide the joystick around (my other favourite), and finally the last side lets you roll the gears and sphere (and the sphere has a very satisfying click in feature). My cube has had a lot of use and still works perfectly unlike some of the knockoffs that are in the garbage after coming apart. I wish the case for the Original Fidget Cubes was available at Mastermind as I’d love to be able to hook my cube on my keys or to a bag (they are available online but shipping to Canada requires a large order so I’m more likely to order a knockoff case and attach a key ring myself). 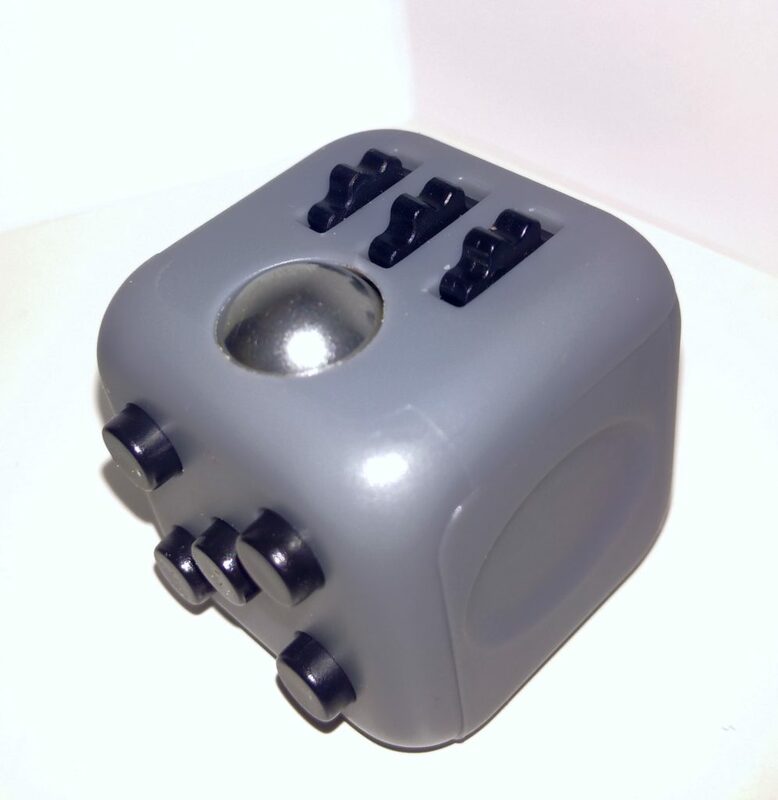 My Original Fidget Cube – top is the spin side, the 5 buttons are on the left and on the right is the breathe indentation. This is a relatively new addition to my fidget toy collection but I really like how it is completely mindless and fun to use. 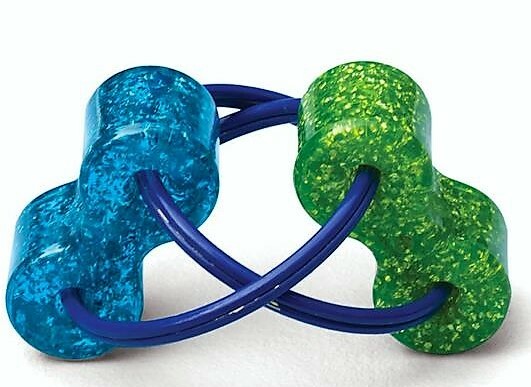 All you have to do to fidget with the Loopeez Fidget toy is spin one of the coloured plastic pieces around the dual axes of the rings. The plastic pieces are molded to fit perfectly into your hand which is awesome and they don’t make a lot of noise when you are using them. It’s pretty unobtrusive to use too – I’ve used them in a few meetings without anyone being any the wiser. Loopeez are great stealth fidget toys. This is the fidget toy that I’ve had the longest. My mum bought me my Figit For Your Digit over a decade ago and i’ve been using it ever since. 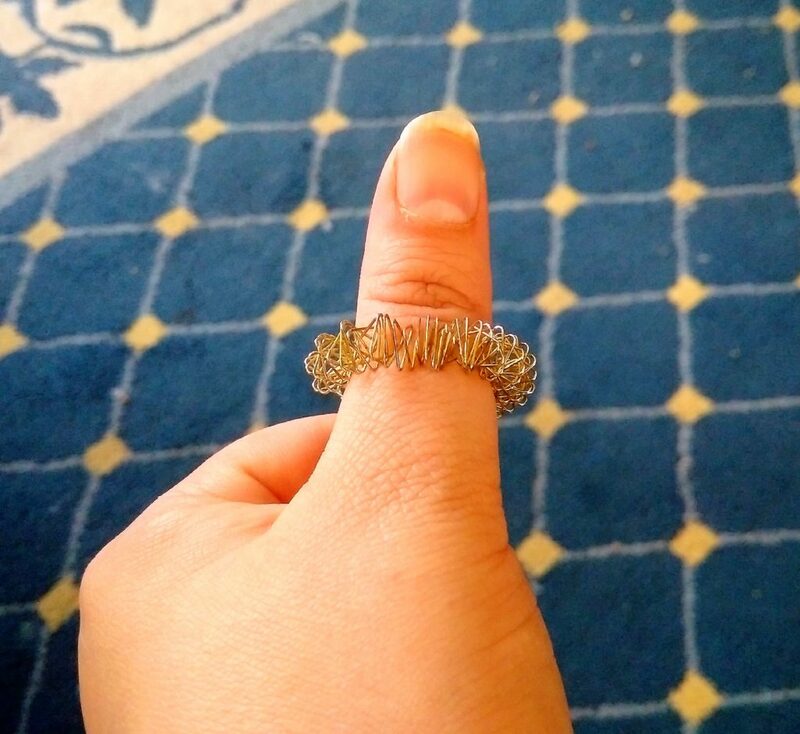 It’s also the simplest fidget toy I’ve got – it’s just a ring; but it’s the way the wire is coiled into the ring that makes it one of my favourite toys. All you have to do is move the ring up and down a finger (or thumb in my case) and it gives great proprioceptive input and a really nice massage too. I’m using it more now than I did when I first got it because it makes my fingers feel better when they’re achy after doing too much typing and jewelry making or other fine motor skill work. It’s another great stealth fidget because it’s just a ring. It’s silent and very satisfying to play with. My only complaint with it is that it’s small enough that I misplace it at least once a week. If the idea of something to occupy your hands is appealing to you either for yourself or your kids but you’re not sold on fidget spinners as an alternative, consider one of the above fidget toys. There are lots more out there if none of these work for you; it can take a little bit of trial and error to find the right fit for each person’s sensory needs. Other favourites I’ve used over the years include Thinking Putty and stress balls. When used correctly, fidget toys provide just the right amount of sensory input without creating distractions and can help enhance attention spans and the ability to focus. For me, they’re invaluable tools for the kids I work with and for myself as well and I almost never leave home without one. If there isn’t a Mastermind Toy store near you, fidget toys are available online and in a number of toy and school supply stores if you want to try before you buy. This is wonderful! We literally own this exact Tangle Jr. and we have a twiddle, too (it’s a happy green colour!). I like the Fidget for Your Digit! That’s great! I love my blue twiddle but the green is very happy. The figit for your digit is so nice when I’ve been hard at work stamping. Great selection of fidgets other then spinners. I’ve tried the first three but I’m curious to try out the Loopeez. Thanks for sharing! They’re great and a fairly inexpensive investment. 🙂 Mine get a lot of use.